Keen to expand the usability of its recently revamped robot dog, Sony has just introduced a new “Aibo Patrol” feature as part of its latest software update. No, it doesn’t turn Aibo into an enraged, slavering guard dog that’s ready to pounce on any intruders that break into your home in the small hours, though it’d be good if it did. Rather, it’s a bit of new functionality that might help bring an end to that internal dialogue you’ve been having over whether you should’ve spent $2,900 on a plastic, computer-powered pup. Apparently the clue is in the name, as Sony says the new feature will let you use the My Aibo app to create a “person-of-interest registry” containing the faces and names of up to 10 people. While you may initially be minded to input the current roster of rogues populating the FBI’s most wanted list, be aware that the chances of any of these people entering your home are really rather small. In that case, you’ll be better off entering the faces of family and friends, or whoever frequents your living space on a regular basis. After that, whenever you issue the appropriate command, Aibo will play the “Puppy Patrol” melody, make its way to a selected room in your home, locate the person of interest, and then “show off its adorable moves,” so says Sony. Aibo will also “patrol a room and report on its condition,” though it’s not entirely clear what that actually means. Sony released the original Aibo in 1999, and sold 150,000 units during its seven-year life. The more advanced version, which arrived in 2018, incorporates a new set of actuators for greatly improved natural movement that enables it to perform “hundreds” of different actions and gestures. Aibo also received a new pair of OLED eyes that “sparkle with a clever twinkle” to give it multiple facial expressions, according to Sony. Cameras behind its eyes enable it to map rooms and go on its patrols without knocking into obstacles, while built-in sensors allow it to realistically express a fear of heights, as well as avoid small spaces where it might get stuck. The main upgrade, however, is the addition of artificial intelligence that means Aibo can modify its behavior over time and respond in different ways as it becomes familiar with its owner’s unique characteristics. Digital Trends’ Kim Wetzel spent a week with Aibo in her home and described exactly what it was like living with a robot dog. Sony said this week there are more features on the way for Aibo, including the Aibo Premium Plan, which, unlike Aibo Patrol, sounds like it comes with a price tag attached. 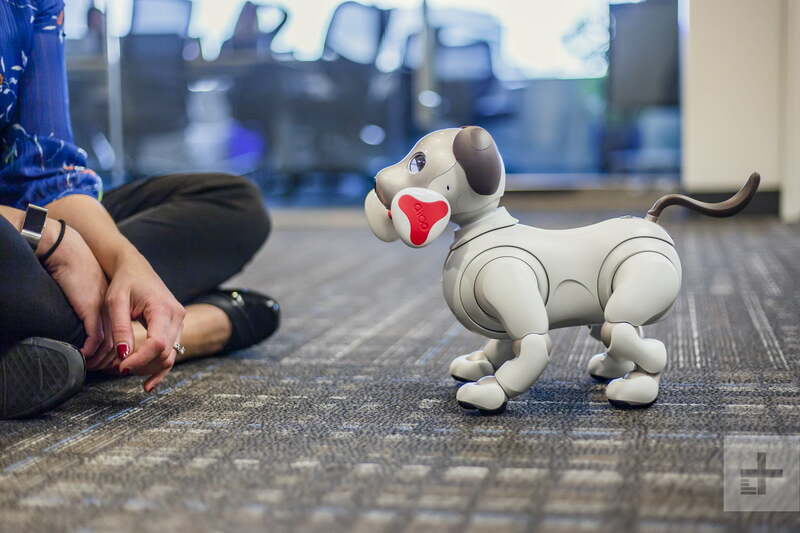 Scheduled for a June 2019 release, the Premium Plan will add more smarts to Aibo Patrol, such as the ability to remotely send Aibo on a patrol around the house. It’ll also remove the limit for the number of photos Aibo can store (currently 500), provide original photo album designs, and more besides.